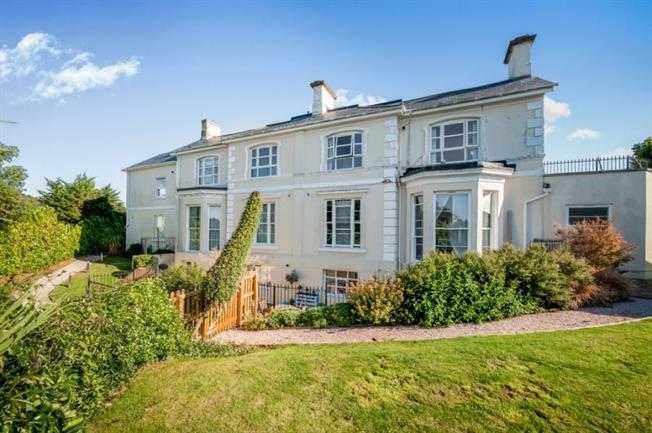 2 Bedroom Flat For Sale in Torquay for Offers in the region of £140,000. Lansdowne Court Apartments are nestled in a cul de sac location in the heart of the English Riviera and being in proximity to local amenities and attractions. The property has been equipped to a high specification offering a welcoming living area, modern kitchen with integrated appliances, two double bedrooms one having en- suite shower room, and a modern fitted kitchen. Allocated parking and communal gardens. Viewing is highly recommended to fully appreciate the accommodation on offer. Shared access with one other flat. Carpeted floor and artistic wall panelling, doors to bedrooms, bathroom and lounge. Ceiling light. Beautifully presented with dual aspect double glazed uPVC windows facing the front and side with views over the communal gardens. Radiators X 2, carpeted flooring and a ceiling light. A modern kitchen fitted with a range of matching wall, base and drawer units with roll top work surface over incorporating a stainless steel circular sink and drainer with mixer tap. There is also a freestanding electric oven and hob with extractor over, washing machine as well as a fridge and a freezer. Dual aspect double glazed uPVC windows facing the rear and side with views over Torquay. Radiator, laminate flooring and ceiling light. Double glazed uPVC window facing the front over looking the communal gardens. Radiator, carpeted flooring and ceiling light. Double glazed uPVC window facing the rear with stunning views across Torquay. Radiator, carpeted flooring and ceiling light. Double glazed uPVC window with obscure glass facing the rear. Heated towel rail, laminate flooring, built-in storage cupboard and spotlights. Low level WC, roll top bath with mixer tap and shower over bath, pedestal sink with mixer tap and extractor fan. To the side of the property there are beautifully maintained communal gardens mainly laid to lawn with shrubs and plants surrounding. There is also allocated off road parking.